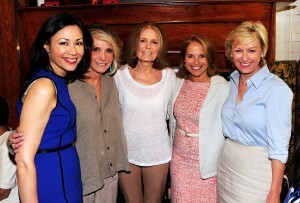 I hope you will tune in to HBO Monday night (8/15) at 9 for the documentary profile of my friend Gloria Steinem. It’s an extraordinarily instructive film–and even though I was around for a lot of it (as reporter and then friend) watching the sum-in-celluloid of this remarkable woman was very moving. 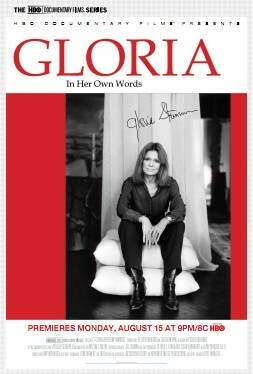 While I’d seen a DVD version of Gloria–In Her Own Words, sitting in a theater to watch with Women’s Media Center family and friends one night last week brought to full power her lifetime’s achievement. I took with me four Black media professionals–a group I meet with regularly to talk about “the business”–two young women, two young men (after all, feminism is for us all.) I think our responsibility now is to make sure a wide audience has access to this life story: absolutely singular, worthy of emulation. Speaking of the media, HBO’s Sheila Nevins, the genius behind so much good work at that network, hosted a media luncheon for Gloria this week at La Grenouille: Katie Couric, Ann Curry, Gayle King, Tina Brown, Leslie Stahl, Glamour editor Cindi Leve–along with a sprinkle of actors–Candace Bergen, Kim Cattrell, Christine Baranski.